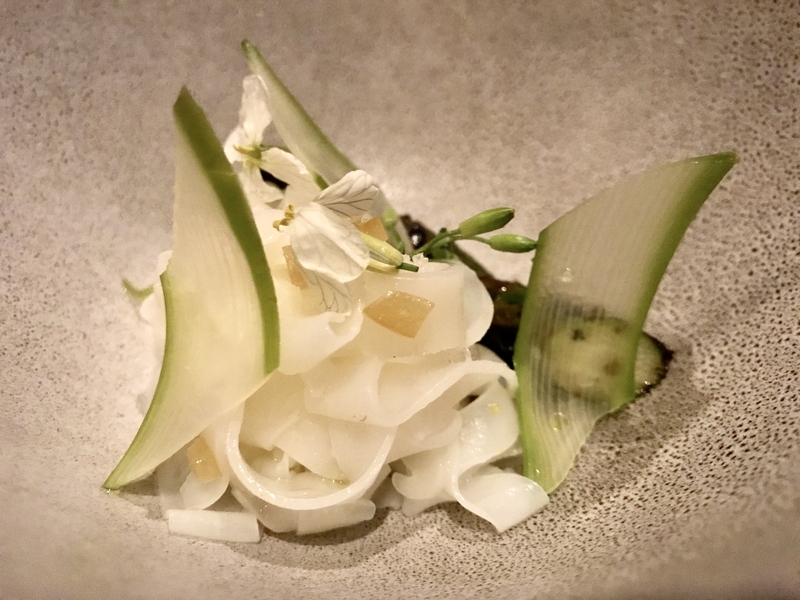 I wrote about lunch at Mourad a few months ago, (you can read about it here), so all I’m going to do now is give you a brief description of my most recent dreamlike dinner at the San Francisco restaurant. It was a birthday celebration for someone I’ve known and loved for most of my life. and then went on to this…. 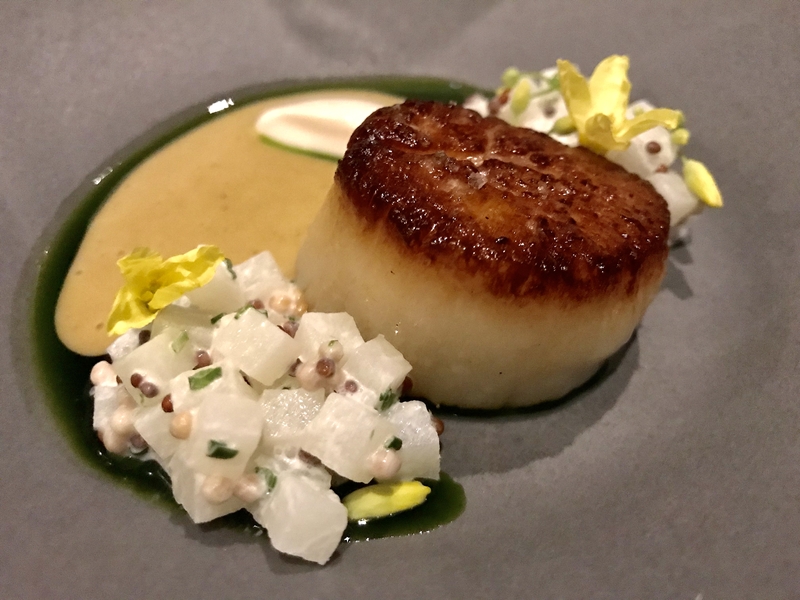 and then this single shining scallop, gently seared, nestled against a heap of kohlrabi with the sneaky aroma of vaudovan perfuming the air. 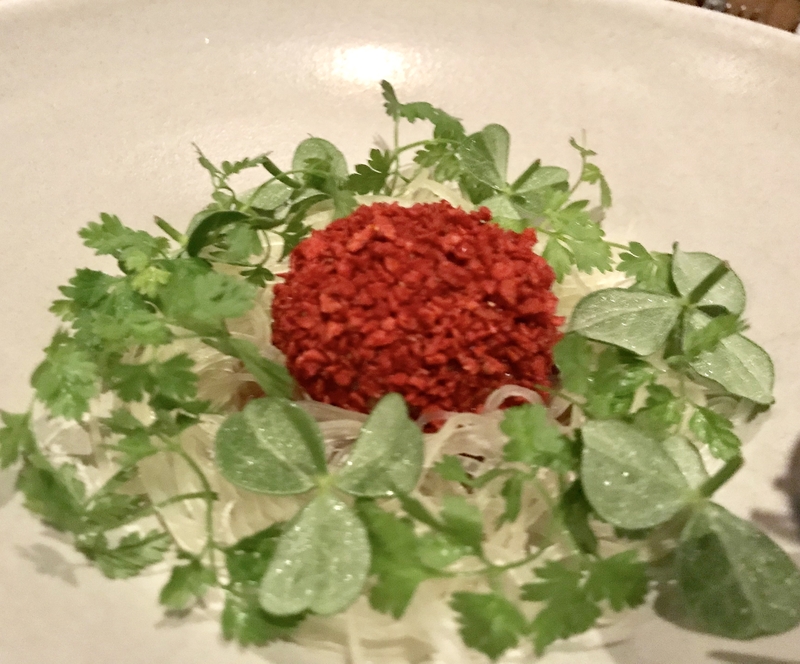 and then Mourad’s take on foie gras, which involves strawberries, pink peppercorns and papaya encircled in a garland of greens. 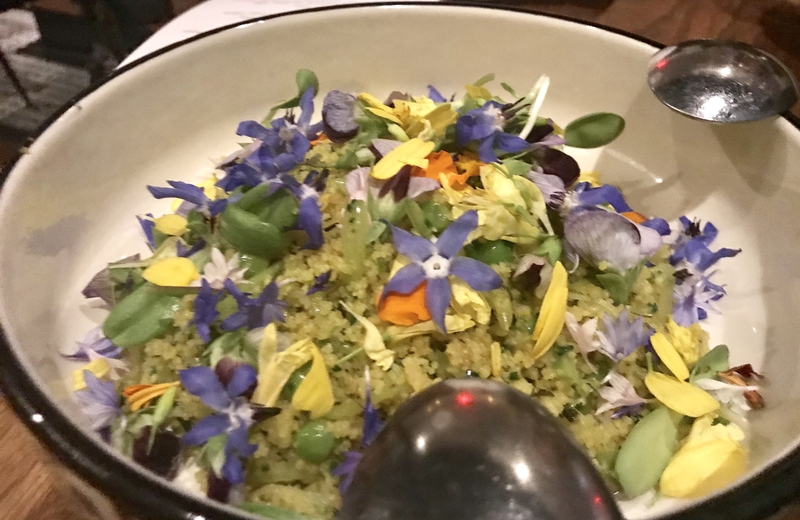 and butter-braised couscous with flowers dancing across the top. Finally, something sweet, all crunch and crackle. Another gift? The restaurant is quiet, comfortable and a perfect place to talk. I can’t think of a more perfect place to celebrate someone you really care about. 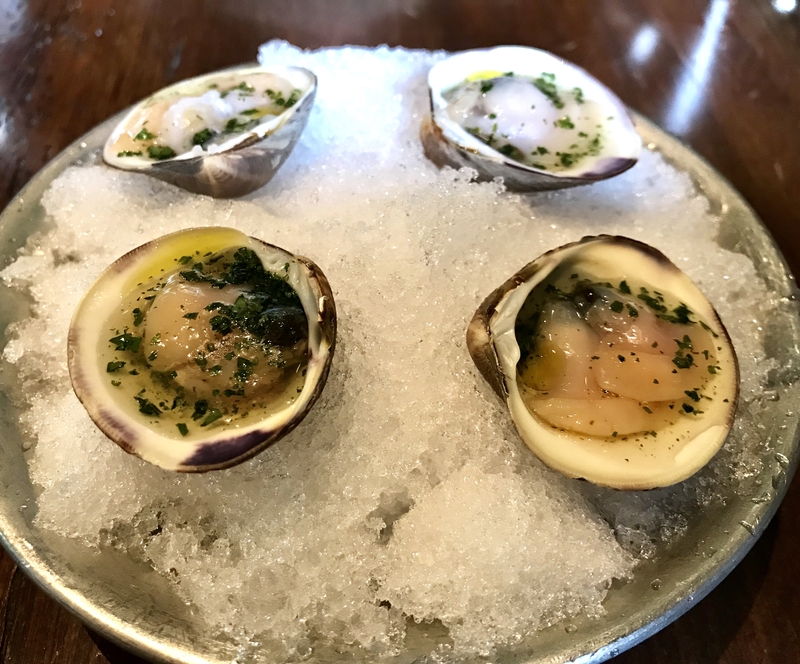 One of the hallmarks of new California cooking might be called “The Mallmann Effect.” (Francis Mallmann, the Argentinian superchef, is famous for his open-fire cooking.) Walking into many new restaurants means approaching a wall of flames. These aren’t merely grills, they’re true hearths, massive displays of firepower that chefs use in all sorts of innovative ways. You see it at Hearth and Hound in Hollywood, and the nearby Gwen. It’s remarkably comforting, a reminder that we all began as cave people, huddled around our fires. 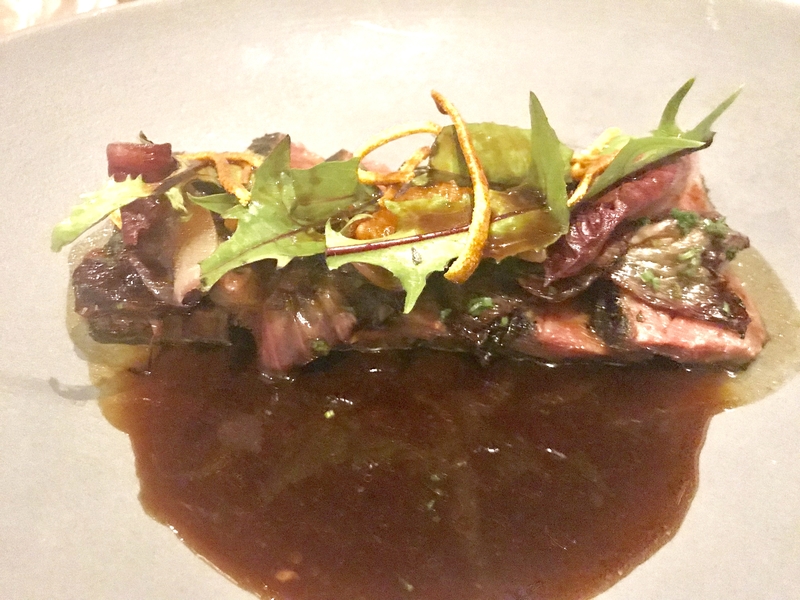 The new Charter Oak in St. Helena is yet another example. 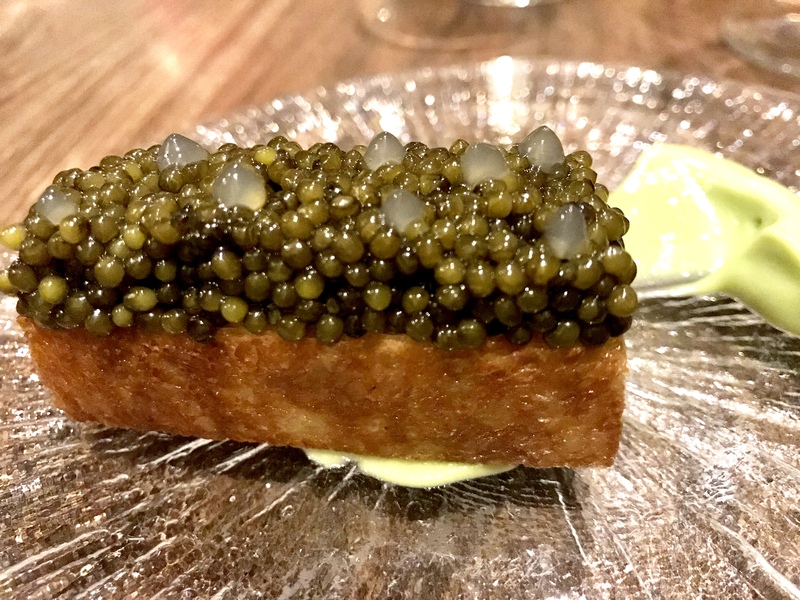 The former Tra Vigne has been handsomely refitted, and the first thing you notice, beyond the high walls and beautiful tables, are those dancing flames in front. Avocados are tossed onto the fire – to astonishing effect. 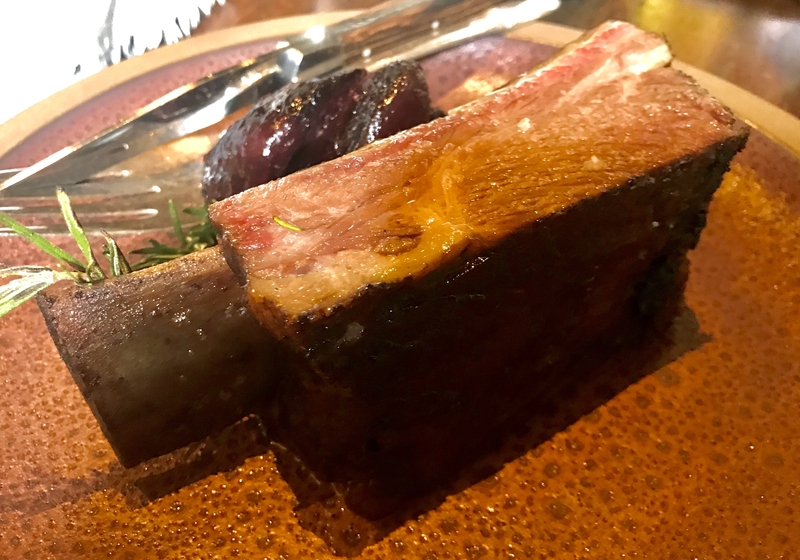 So are short ribs – or rather one massive short rib, which has been pre-cooked to tenderness then thrown over old wine barrels and seared in the flames. It’s a smokey, tender, irresistible piece of meat. Lurking behind it are beets, which have also seen the heat. Their texture is remarkable – somewhere between fresh beets and beet leather. I didn’t want to order this dish. The waiter insisted. “Really?” I said. You want me to try a slow-cooked turnip on pumpernickel rye porridge? 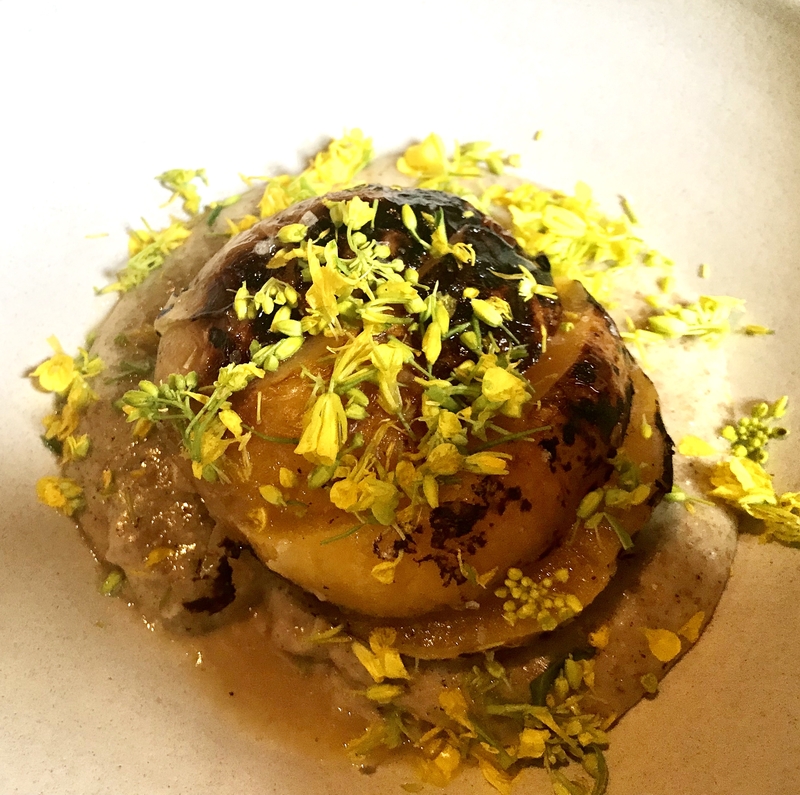 It sounds terrible.” But that turnip – roasted in the embers and then quickly charred – was a revelation. As was the sweet porridge, a new take on congee and utterly satisfying. Not everything is grilled. 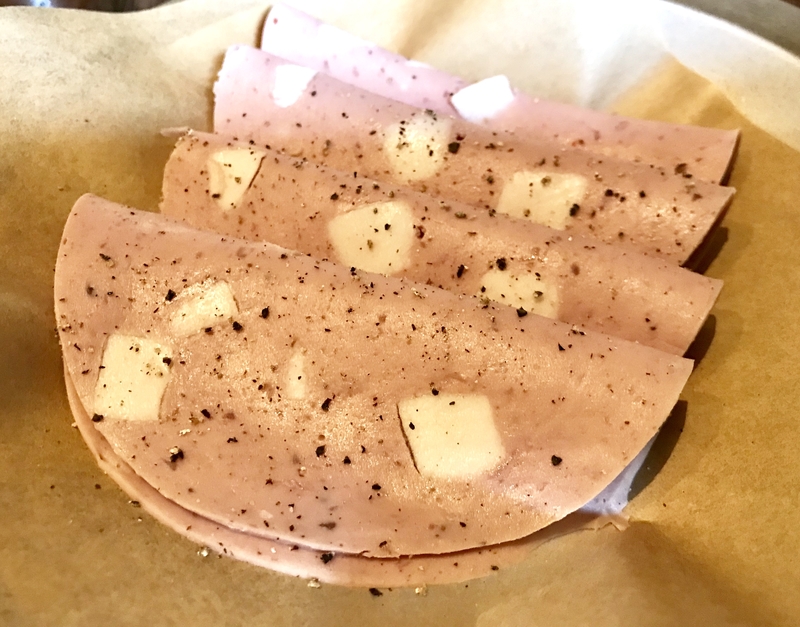 I loved the house-made mortadella. 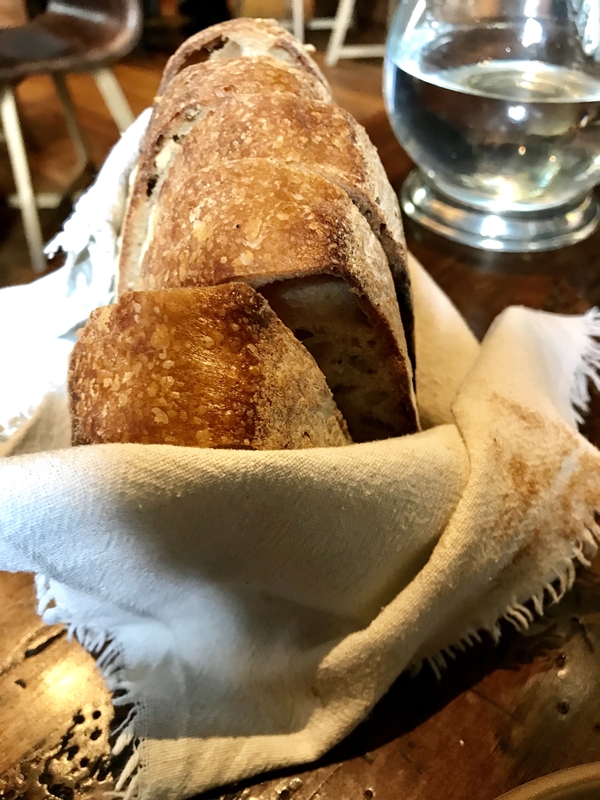 Especially with the fine, warm bread. 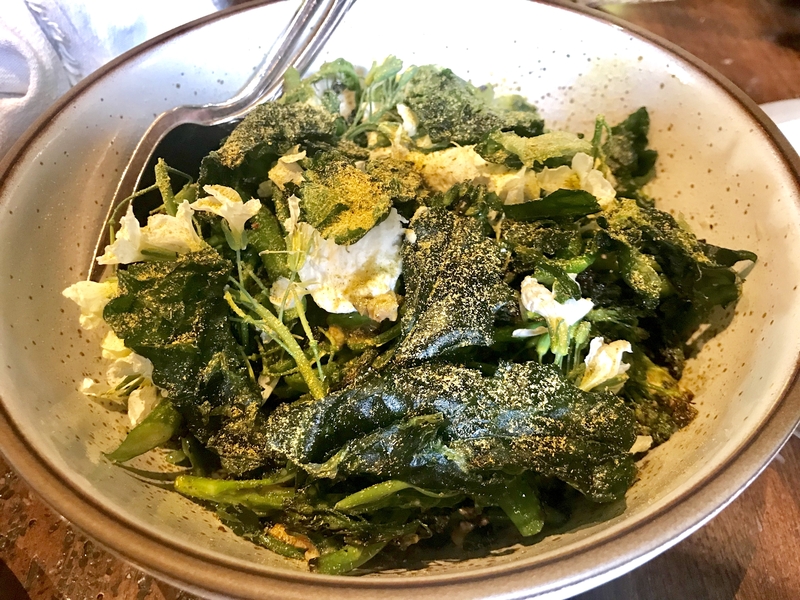 This salad of broccoli, broccoli rabe, broccoli flowers with a few puffed grains, some sunflower seeds and ricotta – is a bit much for a single person. You get tired of chewing. But it would make a fine side dish for 3 or 4 people. When the dessert cart rolled our way we said that no, we couldn’t possibly. And then we did. 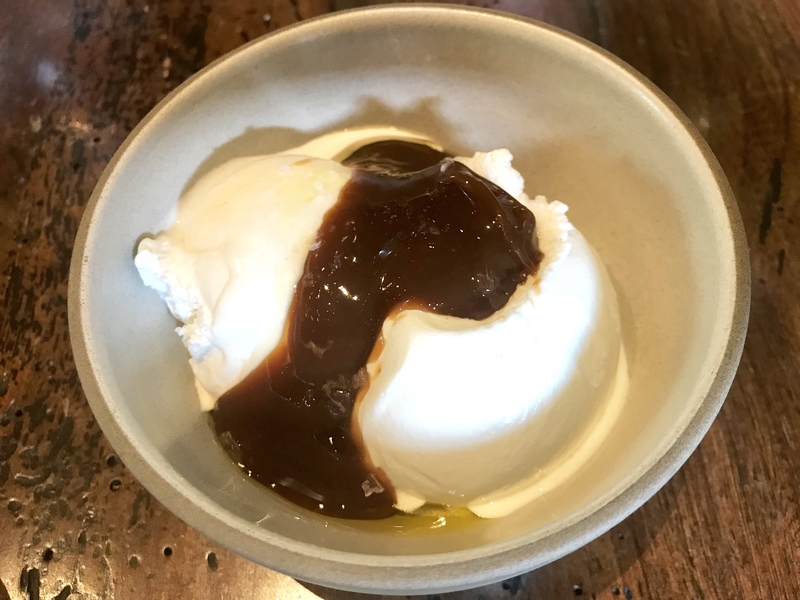 If you go, don’t miss this buffalo milk ice cream with its burnt apple caramel sauce. 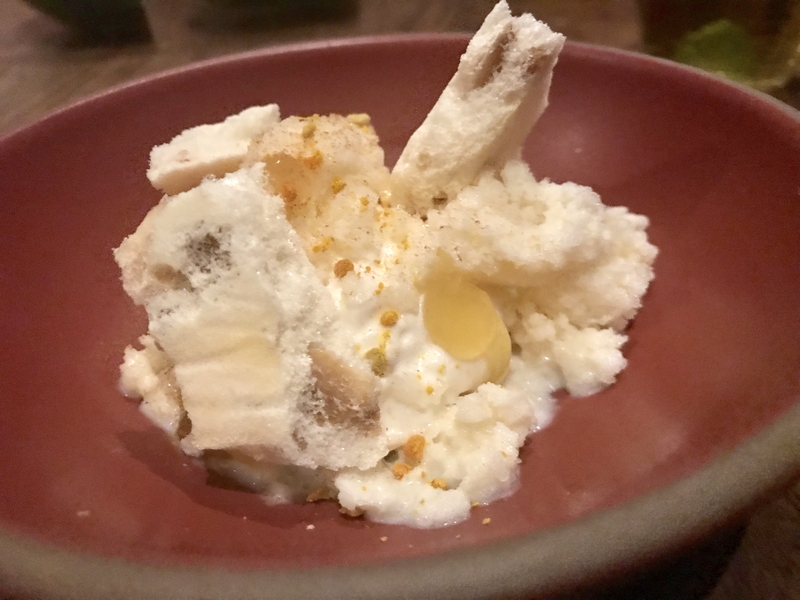 The ice cream has the most astonishing texture – the closest I can come is frozen velvet – and it was such a pleasure that I took one bite after another, absolutely unable to stop. 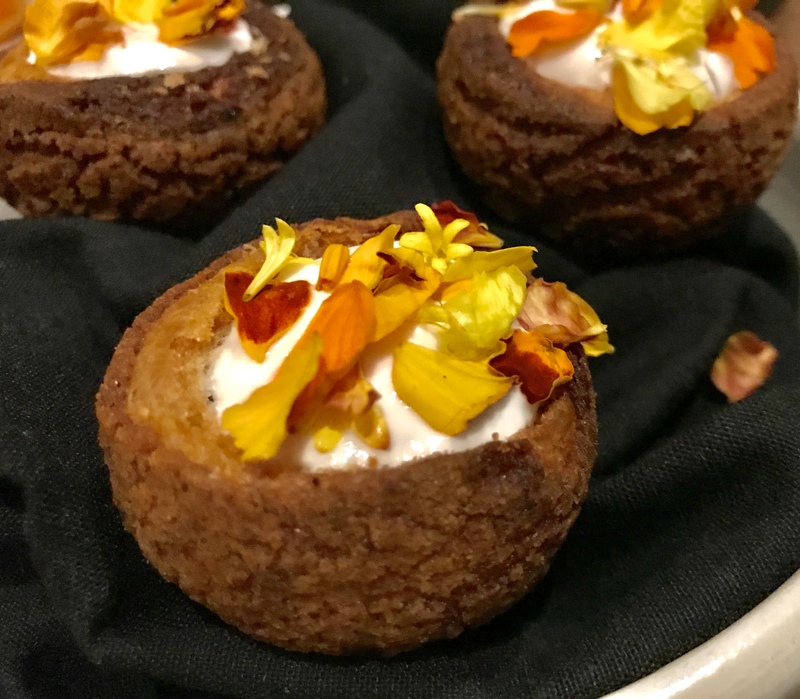 I’m just back from the Worlds of Flavor Conference in the Napa Valley, where the food was stunningly good. And abundant. Every day dozens of chefs from around the world cooked mountains of food in astonishing variety. So much food, in such profusion, that it became almost numbing. 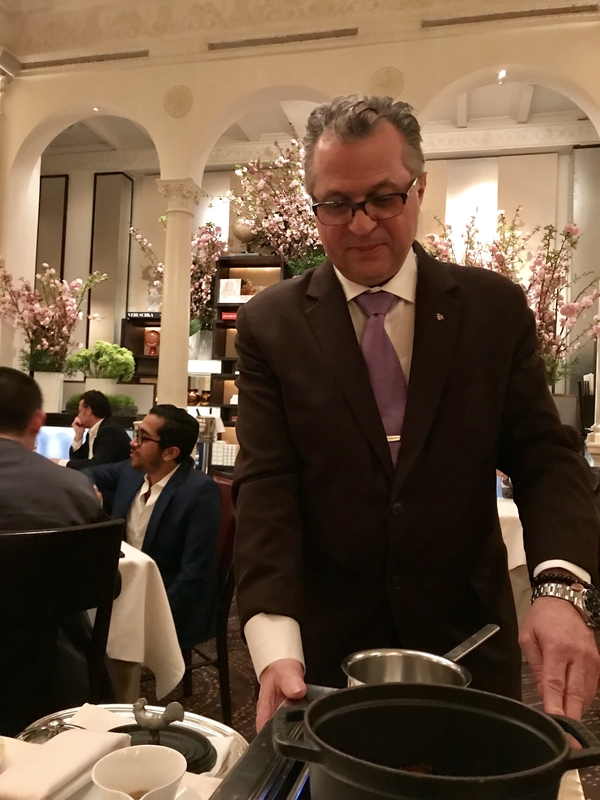 Over the next few days I’ll be posting impressions of the conference, a meal at the new Charter Oak, and a final feast in San Francisco at Mourad. But right now I want to mention a meal I snuck away for. On the last night of the conference I found myself at yet another global feast provided by what seemed like hundreds of chefs. People milled around, munching and exclaiming. Suddenly I looked at all those stations and…. I just couldn’t do it any more. I wanted to stop grazing and sit down for a civilized meal. I wanted to order a few dishes, talk to friends, sip some wine. Wonderful as it was, I wanted out of the movable feast. 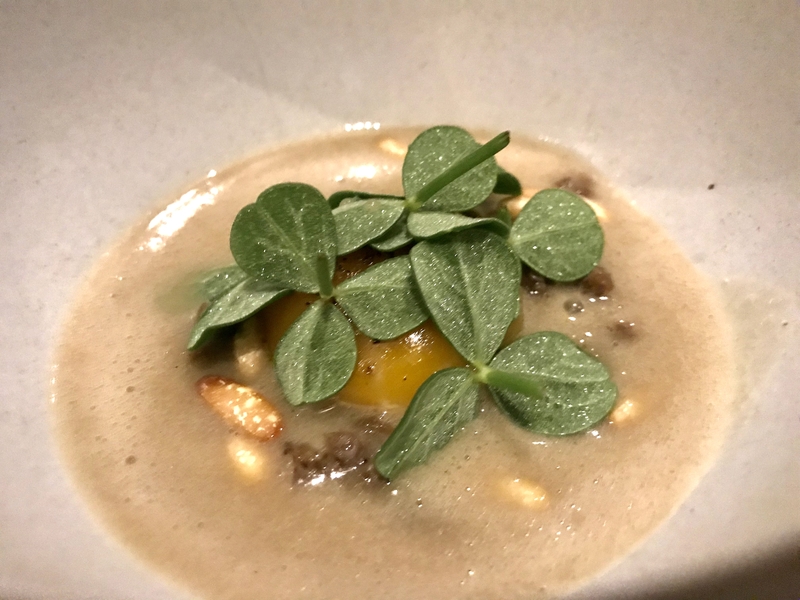 And so I escaped to one of my favorite restaurants: Terra in St. Helena. It was an oasis of calm and quiet. And the food was… fabulous. 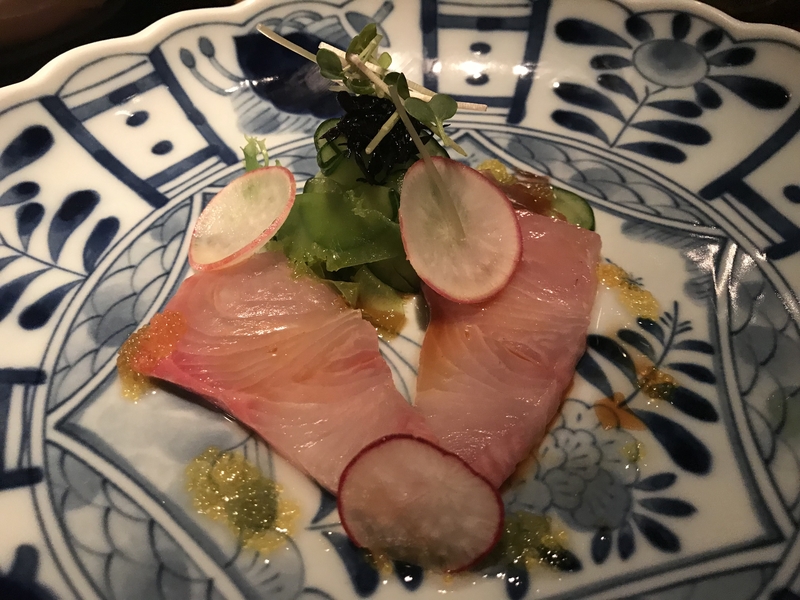 I started with that hamachi at the top. Simple. Elegant. Delicious. 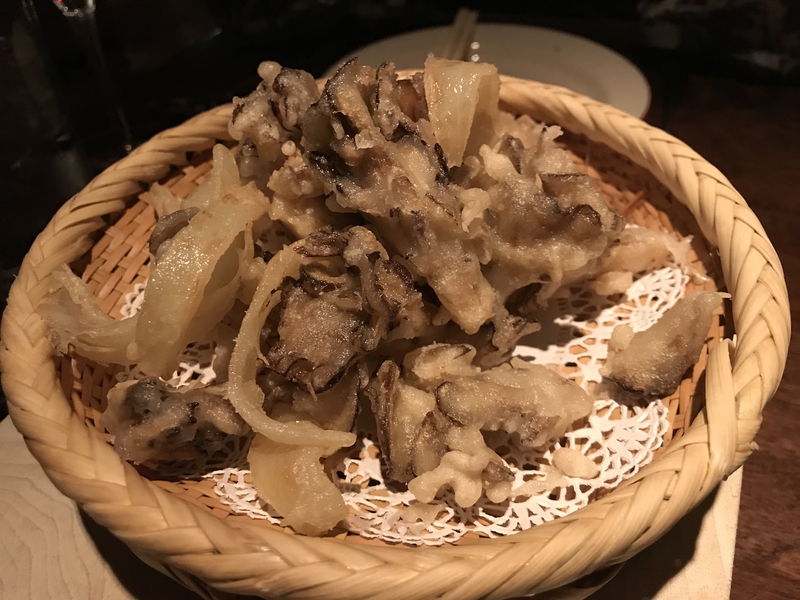 A little fritto misto of maitake mushrooms. 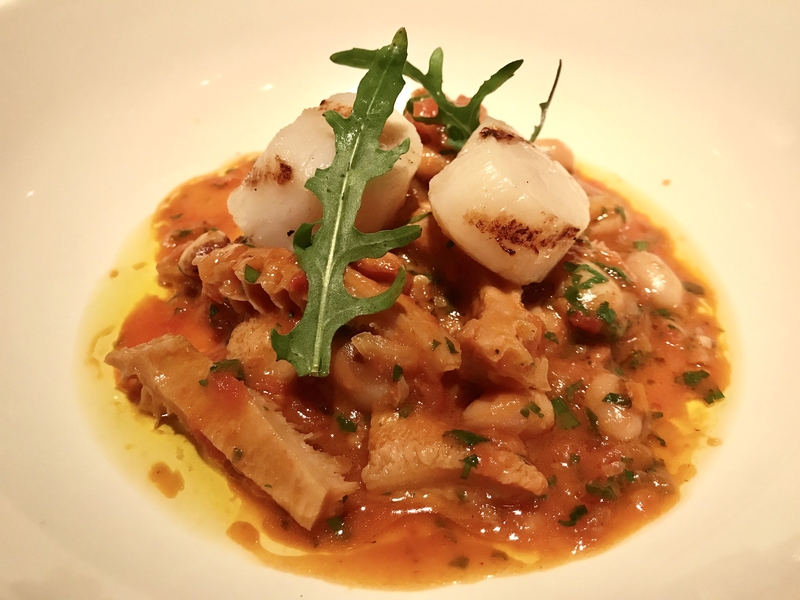 Fantastic tripe stew with white beans and seared scallops. 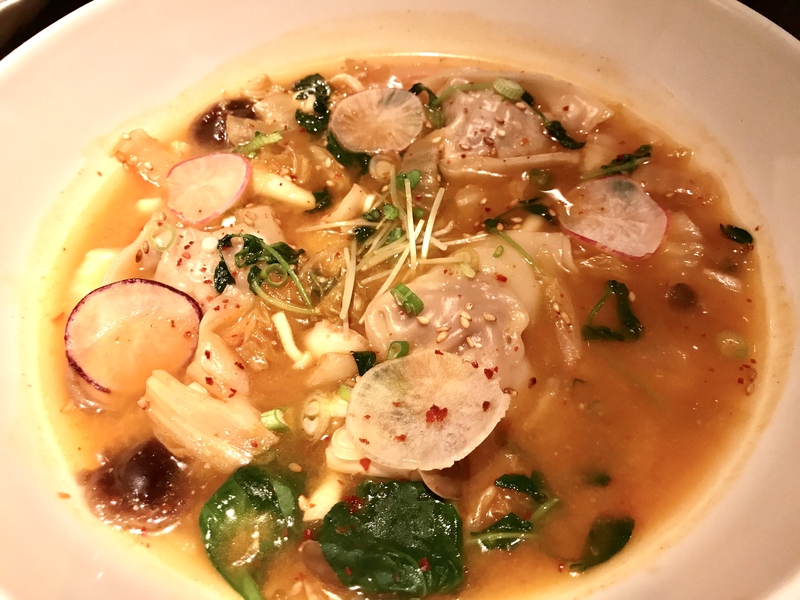 And a dumpling soup, rich with kimchee, fresh vegetables and bright flavors. It’s a comfortable restaurant, popular with local winemakers who pass glasses from one table to another. But as I was leaving I noticed that I was not the only escapee. Sergio Rossi of Milan’s Trippa was there. Earlier in the day he’d done a demonstration of deep fried tripe, where he managed to turn the honeycombed innards into deliciously crunchy little strips dusted with salt and rosemary. They were like French fries with a college education. And what was the great Italian chef eating at Terra? 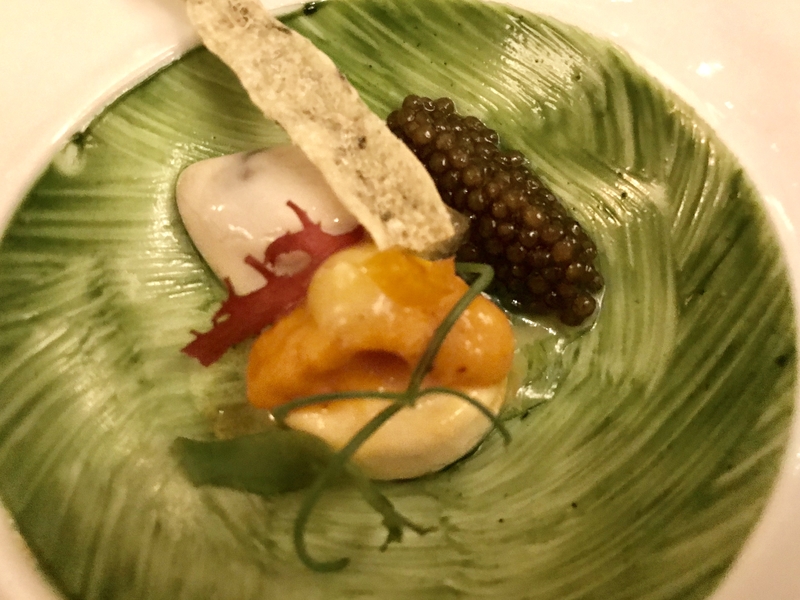 When your evening at Restaurant Daniel begins with a cool crisp little oyster topped with sea urchin and caviar, you’re happy from the very first bite. At least I am. 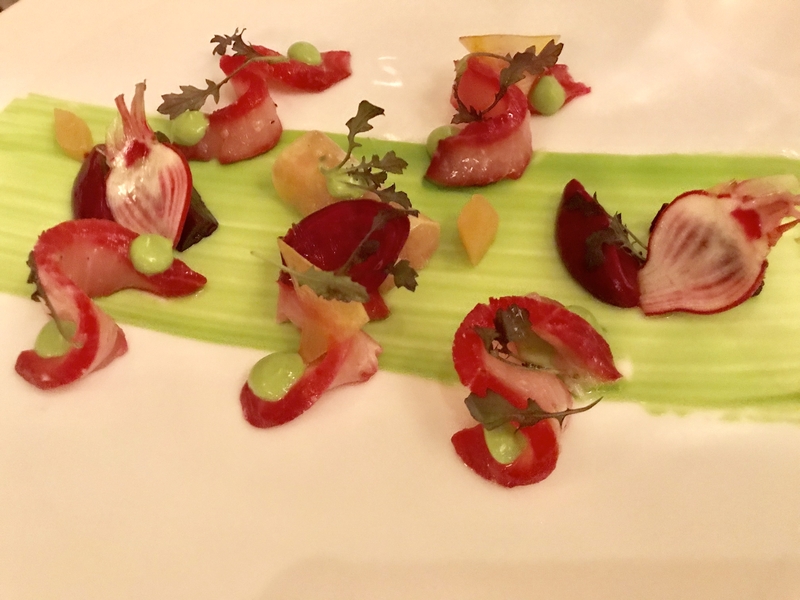 It is followed by this citrus-cured hamachi, tinged with beets, on a jaunty swoosh of chive aioli. 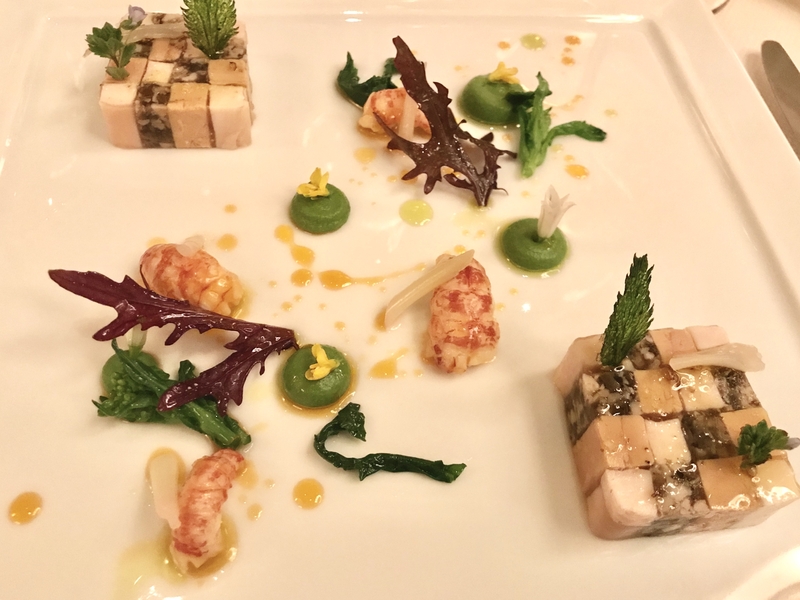 Then this mosaic of poularde (that would be a fat castrated chicken) and foie gras captured in aspic while bits of langoustine, pickled ramps and wild mustard cavort around the plate. 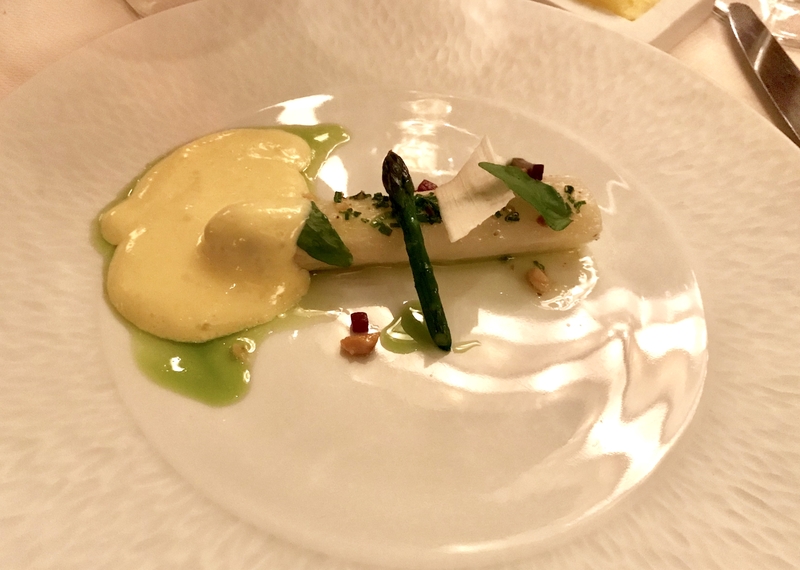 It’s spring, so there will be white asparagus, slicked with hazelnut oil and served with a little puddle of hollandaise touched with a bit of that aged vin jaune from the Jura, which adds a sultry touch of mystery. 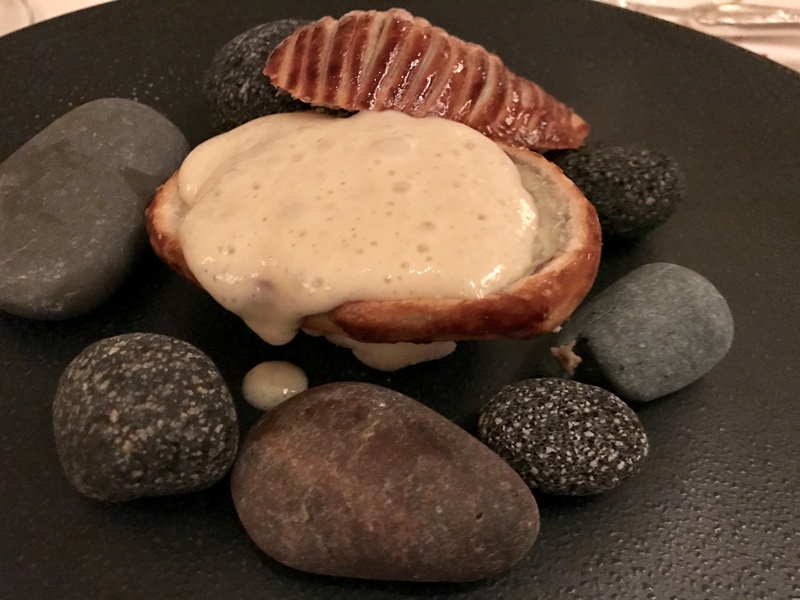 And abalone, served on the rocks in its own private shell of puff pastry. 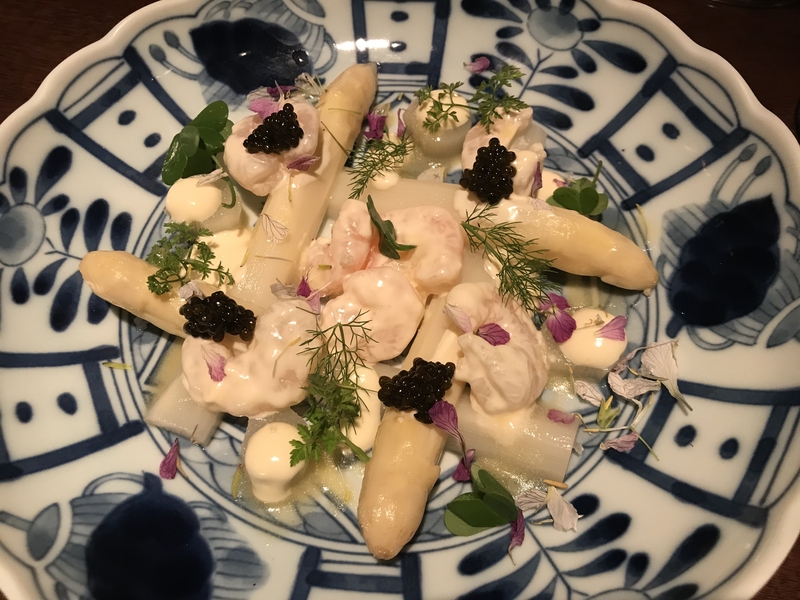 You forget sometimes – or at least I do – about the kind of serious French cooking that requires a platoon of people in the kitchen madly turning and peeling and dicing and saucing – dressing up each morsel of food until it no longer resembles its natural state. 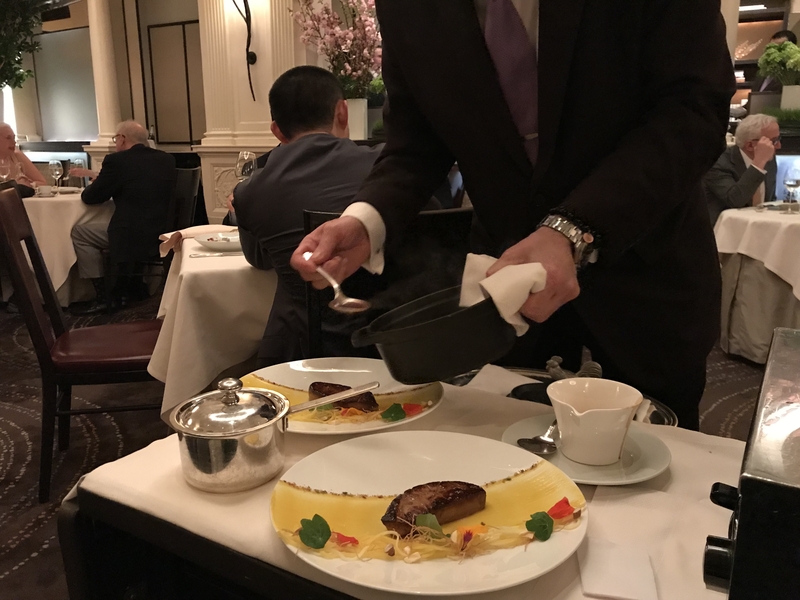 And there is nobody who does this particular kind of celebratory cooking better than Daniel Boulud. 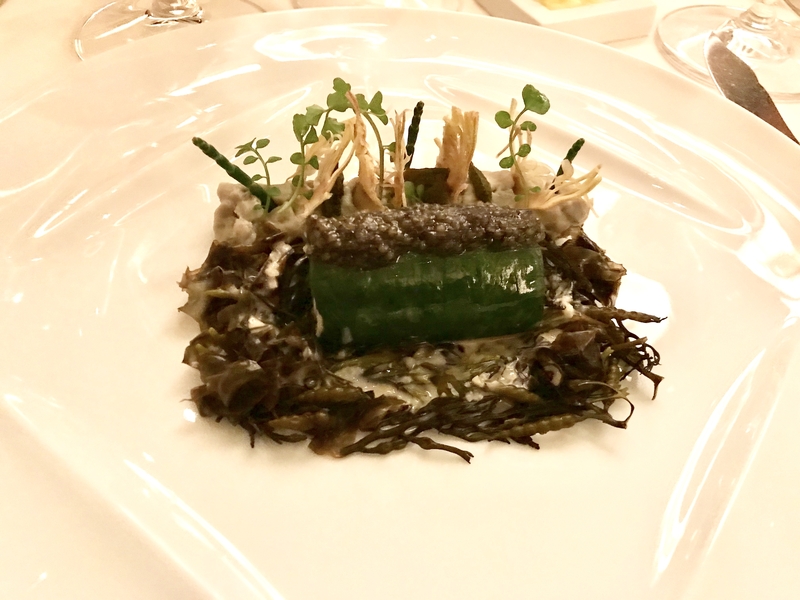 A meal at his flagship restaurant is an instant Special Occasion, and even if it’s not, it will become one. The service is superb. Here comes the captain now, about to strike a match and start playing with fire. 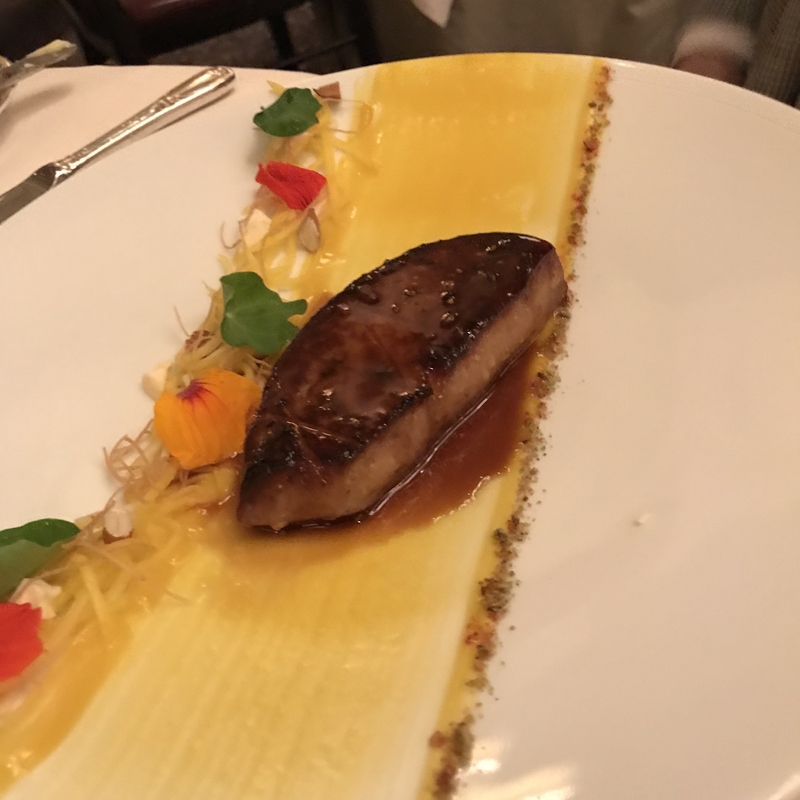 He flames foie gras in mescal, then nestles it into its own private nasturtium garden. 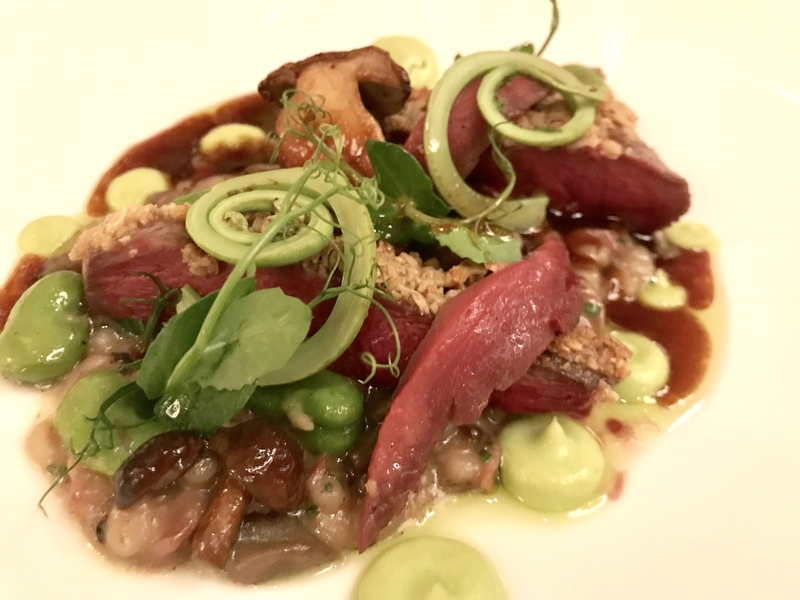 surrounded by an entire palate of spring flavors: fiddleheads, fava beans, pea shoots and tiny mushrooms. 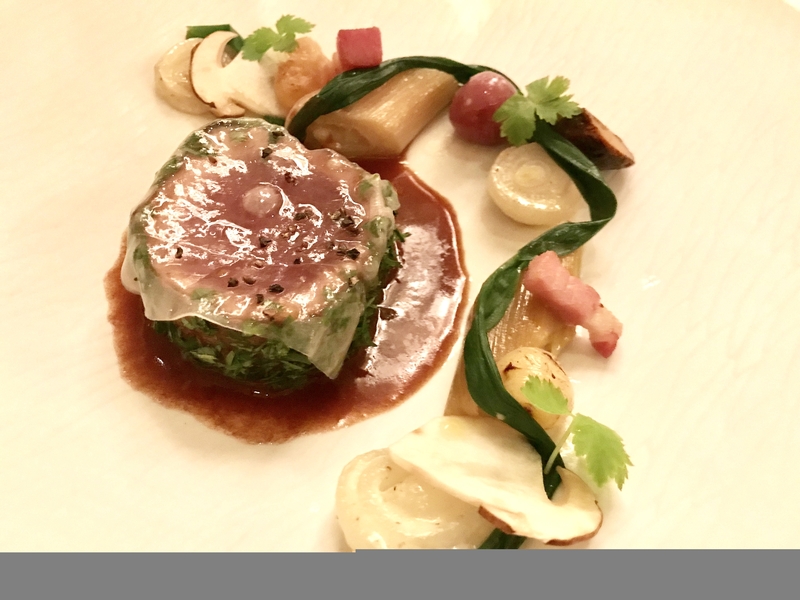 Rabbit comes encircled by grapes, chard and daikon in a rich puddle of reduced saba. I should, perhaps, mention, that there were four of us. 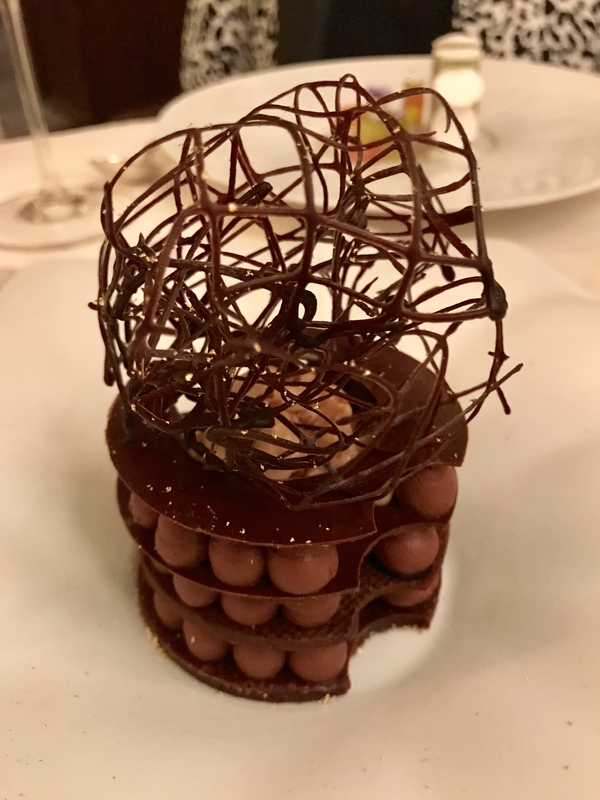 But the food was so beautiful – and so intriguing – we were passing our plates, eager to taste everything. 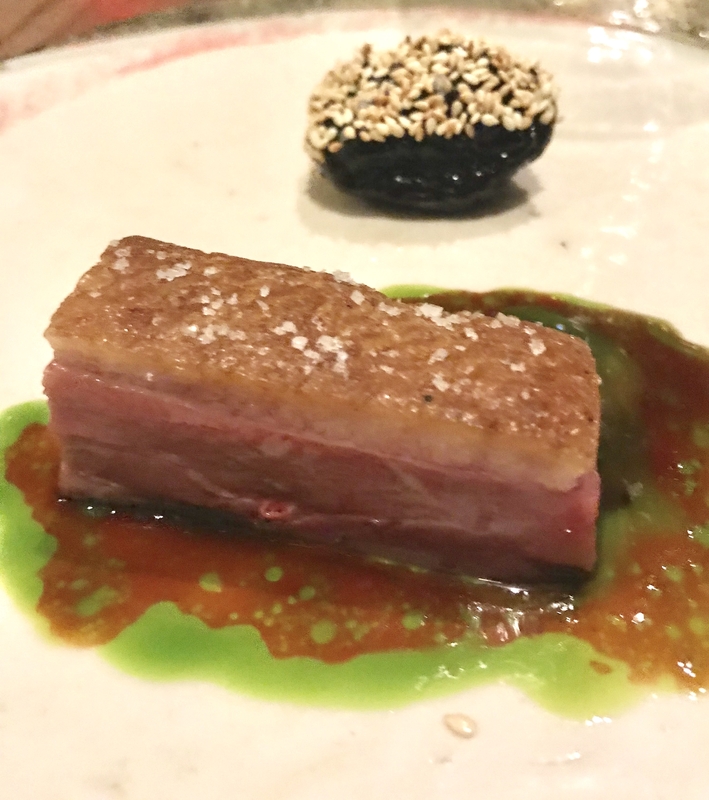 Between sips of a Saint Aubin from Thierry Pillot (Saint Aubin is an often-overlooked wine, which makes it one of the most affordable white Burgundies) and a deep Pelissero Barbaresco, we came to this little treat…. 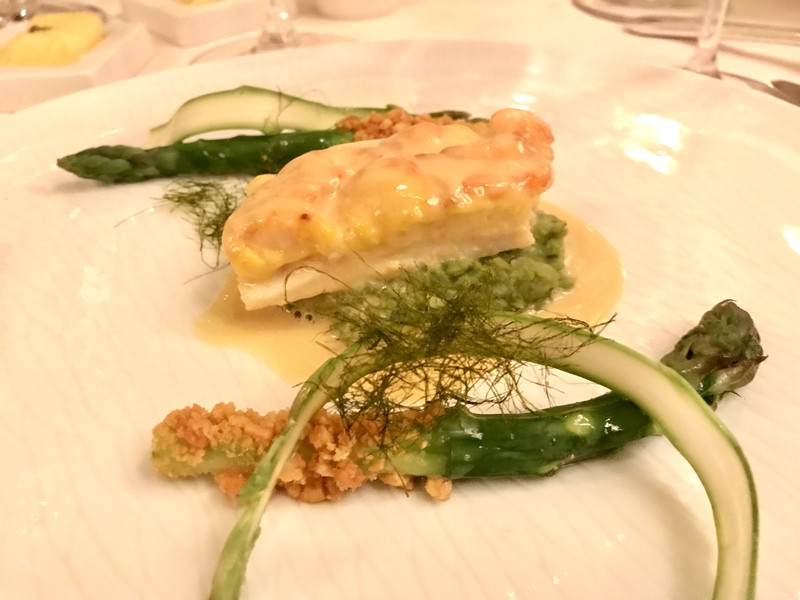 with spot prawns, asparagus and seaweed in a saffron sauce. This is fairy tale food, and it’s hard not to feel like Cinderella. Daniel creates a fantasy for you: for a few special hours you are a pampered person living in a more gracious time. He knows not to end this story too abruptly. After dessert there is a basket of madeleines, still warm from the oven, breathing vanilla. 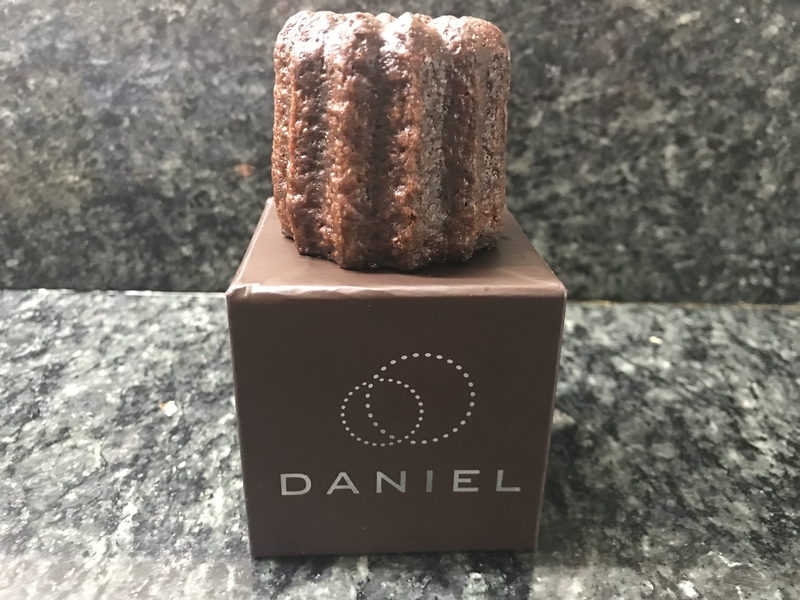 And finally adorable little boxes to take home, a gift for the morning, when you can eat your cannele and relive dinner. 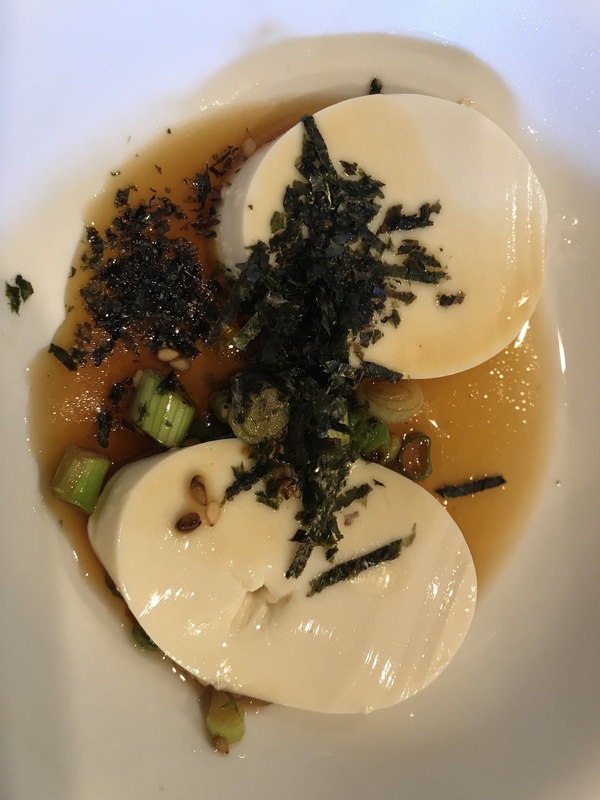 One of the things I miss most about LA is Beverly Soon Tofu, which I’ve been going to since it really was on Beverly Boulevard (the restaurant moved to Olympic Boulevard thirty years ago). 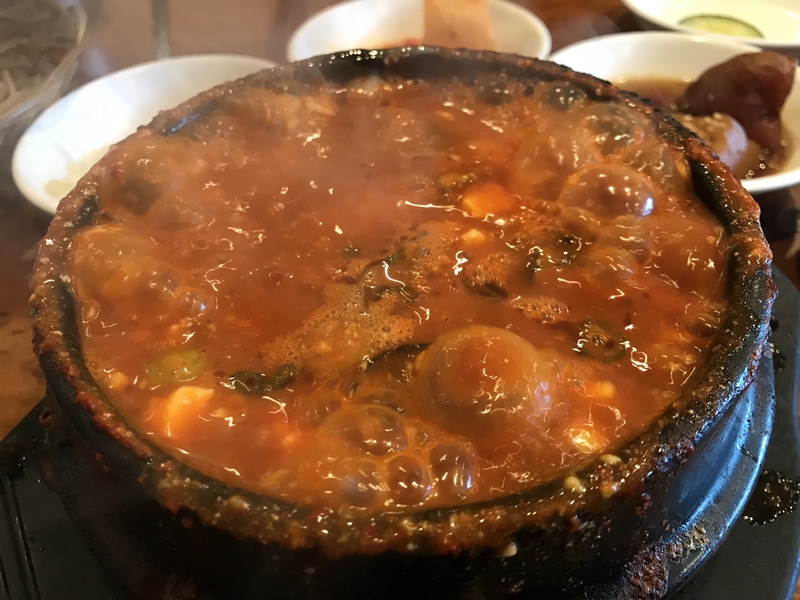 There is nothing more comforting than a big bubbling bowl of soondobu jiggae. You walk into the small restaurant and put your name on the list. Then you wait for an empty table. 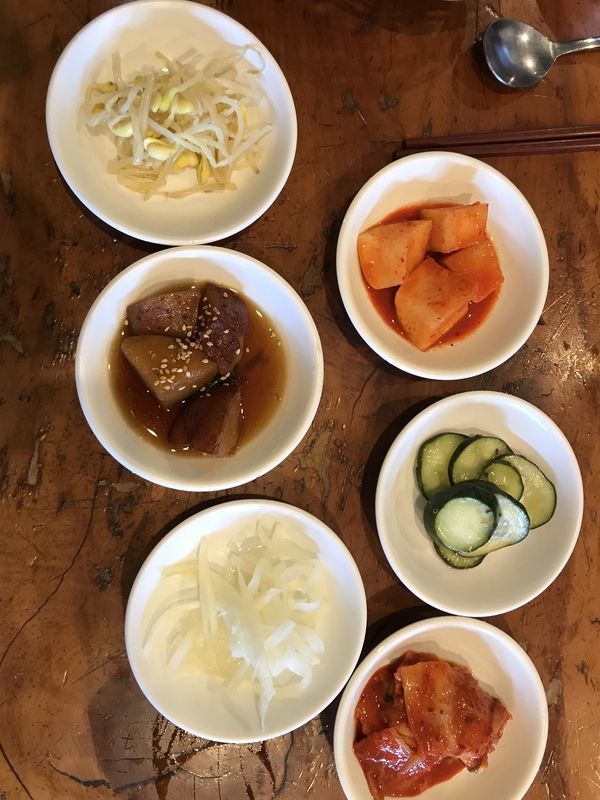 When your turn finally comes you slip into one of the backless stools and decide how you want your tofu stew: there are many permutations- vegetarian, pork, shrimp, even spicy cod roe. Then you decide your level of heat; go for the hot, which isn’t painful. The first thing that arrives are these cool, clean little slices of tofu. 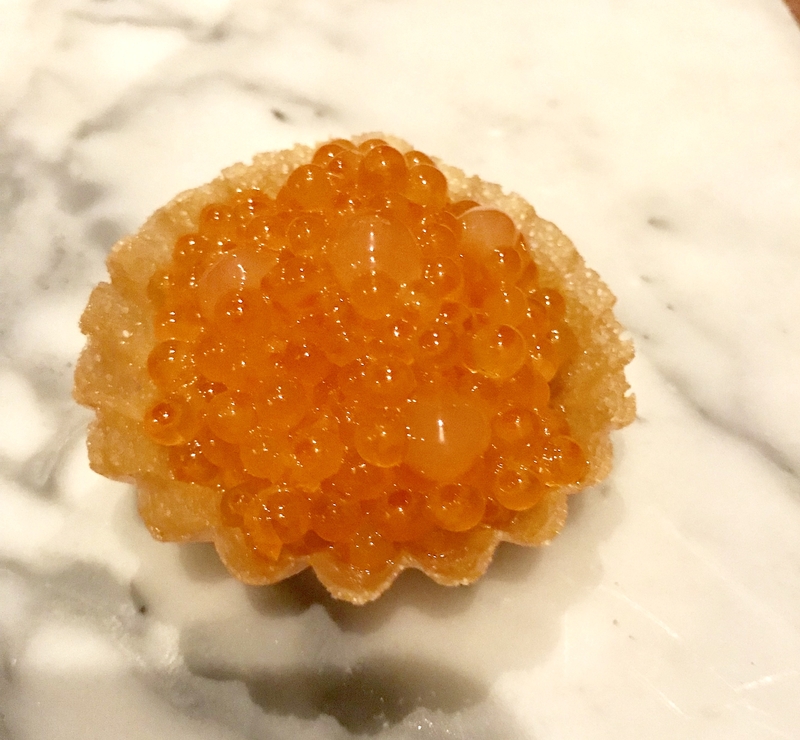 Finally you hear a furious boiling, bubbling and hissing and the waitress appears with your sizzling dinner, which spits angrily as she cracks a raw egg into the middle. And then you eat, slowly and blissfully. If there is a better $12 meal, I haven’t had it.